"I never got your support payment e mail"
Instantly track calendar events and support payer activity. Alerts tell you when your co-parent has viewed, responded or paid a support request. Create recurring events in almost any sequence. Share with co-parents and kids. Receive instant notifications when events are changed or added. Easily create and send support requests. Upload receipts, track overdue payments. Run activity reports and get paid on-line, instantly. Kids can join calendar and chat for free. Support payers do not need to join to pay support requests on-line. Share important docs and contacts with your co-parent or family professional. Choose what to share and what to keep private. Upload expenses. Create custom budget and cash flow reports. Get back on track with your finances. Access our Partners page for expert advise and useful products. Many items are offered on our site are at a discount to standard pricing. As co-parents ourselves, we know its not always easy to get everyone on the same page, that includes convincing your co-parent to subscribe to the same app. That's why we made SmartCoparent useful, even if only one parent is participating. Our application is specifically designed to encourage participation. We made products that you, as a subscriber can use to stay organized and share information with your co-parent, even if they are not subscribers. Your co-parent will quickly notice the benefits of subscribing, without a hassle! See what you can do and share on SmartCoparent as an individual subscriber, on the other side of this page. You can keep your co-parenting schedule completely automated and organized on SmartCoparent. To share with a non-subscriber, simply download your SmartCoparent calendar to PDF and send to anyone on your personal e-mail or text. Click here to find out how. Support payments are fully automated for non-subscribers. Subscribers can send support payment requests and receive payments on line. Non-subscribers can simply click on an e-mail link to view the payment requests, read and store receipts, respond and even pay support on-line, via PayPal - instantly. 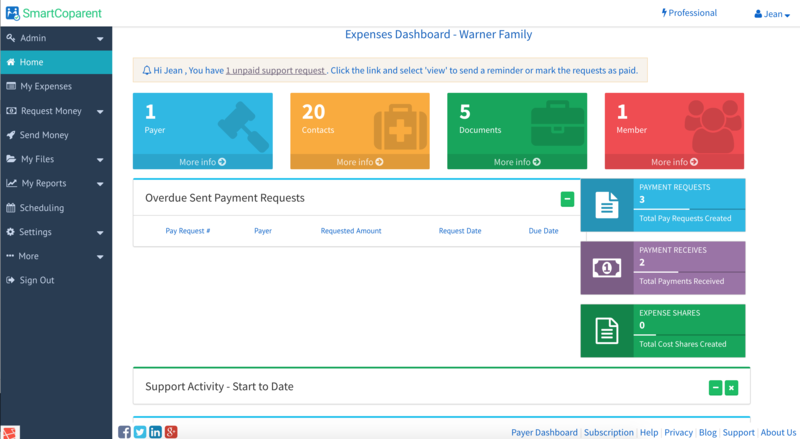 Uploading your expenses to SmartCoparent will turn on valuable cash flow and budget insights on your dashboard. Sharing your expenses to non-subscribers is easy. Simply use our 'export' function to download selected or all of your expenses onto an Excel spreadsheet, where you can forward to anyone on your e-mail or text. 4 Chat, Journal, Reports, More. 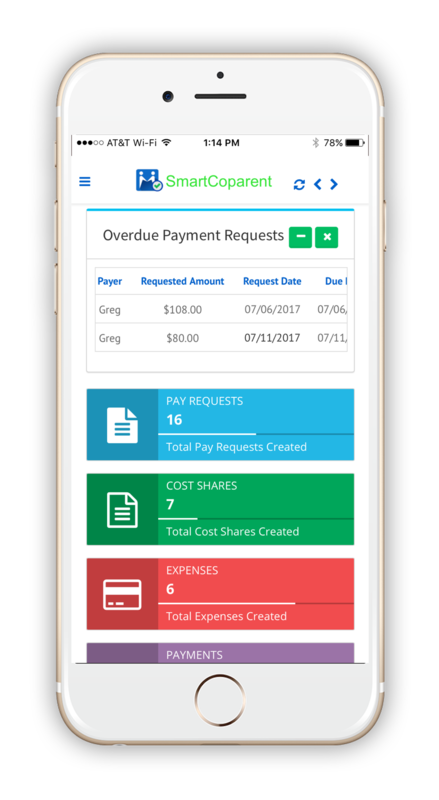 All of your SmartCoparent activity and budget reports, chat and journal transcripts can be downloaded to PDF and shared by you to a non-subscriber. Perfect for keeping your world in order and sharing with co-parents, family attorneys or anyone else that is not yet subscribed to our service. 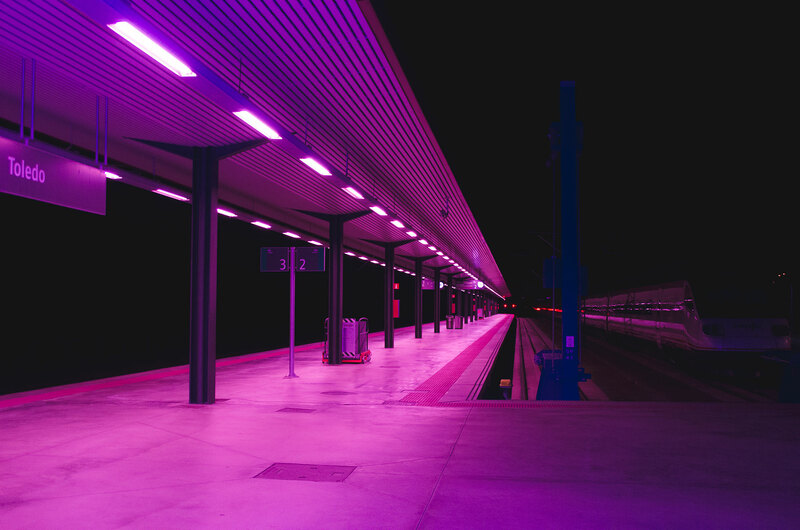 Start on our Free plan. Upgrade only if you feel like.